Guarana has been used for centuries by Amazonian Indians to increase energy, fight malaria, reduce appetite and enhance libido. Today, this herb is used worldwide as a tonic to enhance mental function, promote alertness, improve physical performance and lose weight (it appears to affect the rate at which you think you are full). Guarana is used in sweetened or carbonated soft drinks and energy shots, in tisanes and in capsules. It is available in capsule, tablet, dried herbs, liquid extract or oral spray form. Guarana seeds, which are crushed. Guarana seeds are a powerhouse of guaranine, a chemical substance with the same characteristics as caffeine. They also contain tannins, theophylline, theobromine and polyphenols such as cathechin and epicatechin. Helps impart a sense of wellbeing and motivation. Increases the metabolism, helping to improve energy levels and enhance physical performance. May help in weight loss. Is thought to help sexual performance. When taking guarana, be aware that its effects mimic those of coffee – too much will make you jittery and keep you awake. It should not be taken in combination with ephedrine in diet aids or performance-enhancing supplements. Consult your medical practitioner before taking guarana if you have any of these conditions: heart problems or high blood pressure, kidney disease, an overactive thyroid (hyperthyroidism), or an anxiety or nervous disorder. Avoid if you are pregnant or could become pregnant, or are breast-feeding. Not used in modern cooking. A climbing shrub endemic to the dense Amazon jungles, guarana is now cultivated throughout South America. A single species, Paullinia cupana, grows in tropical Africa. Guarana is not regarded as a domestic plant, but instructions to cultivate it in greenhouses can be found online. A useful reference is the document published by the University of Bonn, Germany. 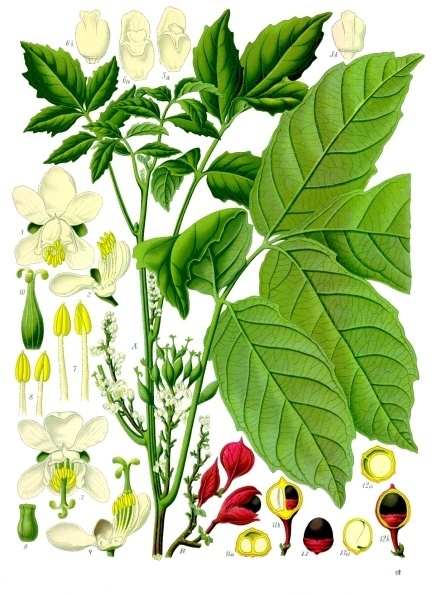 Find it here https://www.tropen.uni-bonn.de/new_website/englische_seiten/Study/SAPINDACEAE_PAPERS2.pdf (or https://bit.ly/12VeAdx). The name ‘guarana’ comes the Guarani people, who live in Brazil. In their culture, the plant and its seeds are believed to be magical, can cure bowel complaints and help regain strength.